Though northern New England continues to get snow, two Vermont ski areas have already retired aging chairlifts. Killington's North Ridge Triple carried its last skiers on Sunday, as a tight replacement timeline has begun. The 1972-73 Heron Poma is traditionally the first chairlift to carry skiers in the east every ski season, so the new lift will need to be completed by early fall. Construction on the new Leitner-Poma fixed grip quad is set to begin "immediately following" the removal of the triple. After having to postpone construction last year due to state permitting delays, Magic Mountain is wasting no time in removing its Black Chair. A video posted on the area's Facebook page this morning shows chairs being taken off the line. The lift was originally installed as a Pohlig double in 1962 and was modified with Yan triple chairs in 1985. Due to many issues, the lift has seldom operated in recent years. The lift did not operate during the 2018-19 season. 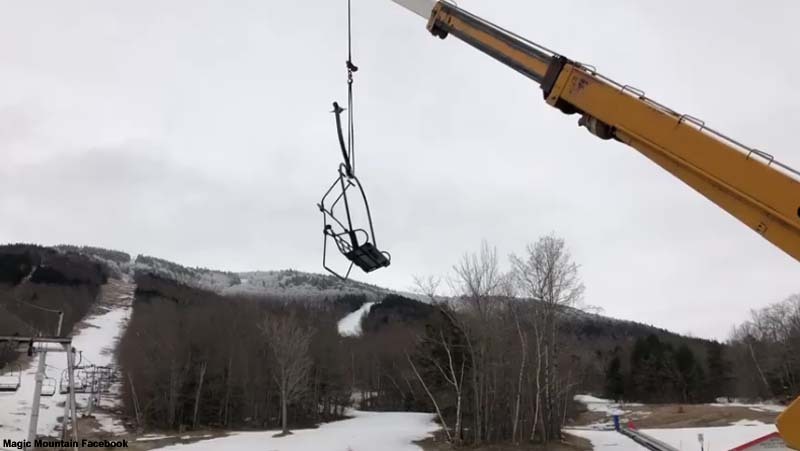 A refurbished Poma fixed grip quad chairlift, originally located in Stratton's Snow Bowl, will be installed on a slightly longer lift line.